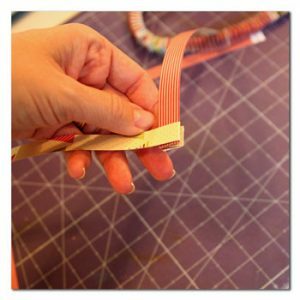 “Remember those box paper chains you used to make as a kid? 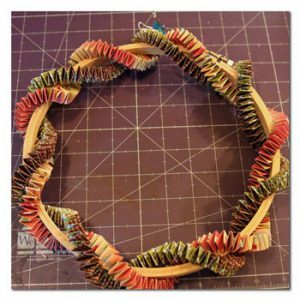 Well, I used them to make this super unique paper chain wreath. It’s hard to say exactly how much paper I used I really didn’t do the best job at keeping track because I used scraps along with whole sheets. I estimate I used approximately 1 1/2 sheets of 12×12 cardstock for each chain. The wreath is wrapped with 4 long paper chains in total. 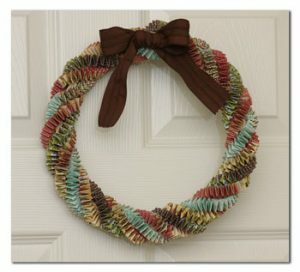 I found this idea on Pinterest it originally came from http://www.michelemademe.com/2011/06/series-6-box-chain-5-paper-wreath.html.